This blog is primarily about speech sounds and their patterning. Symbols are secondary – abbreviatory subsititutes for actual sounds and categories of sounds. But here for a change is a brief transcriptional discussion. Symbols need to be clear in meaning: users should agree on the sound or sounds for which a given symbol is a substitute. And symbols should be clear in form, so that they’re not confused with each other. One sound that I refer to is a raised, rounded version of schwa, a sound rather like the typical “schwa” of French. As I mentioned in another post, it’s common as a contemporary pronunciation of the English FOOT vowel. Many learners of English have a FOOT which is too much like u, and I find they often get a better result by modifying an English schwa (they must develop a good schwa, after all), or by directly imitating the schwa of French, as in le, which many people have in their “mind’s ear”. There are suggestions that this kind of vowel may be present in other linguistic systems, such as Dutch, and other accents of English (e.g. Australian NURSE and Tyneside GOAT). The current IPA symbol for a rounded close-mid central vowel is ɵ, a barred o, for which my mnemonic is Bardot (think lips). Some users dislike the Bardot symbol on the grounds that it looks rather too much like its more famous phonetic neighbour ə, the rotated e which is solidly established as the symbol for “plain” schwa – an unrounded mid central vowel. The Lucida Grande font keeps schwa and Bardot pretty distinct, but they’re less distinguishable in more basic fonts like Arial, especially in small font sizes: ɵə. As an alternative to Bardot, one could use the front symbol ø (with a garnish of centralization if desired, ø̈); I doubt that ø and ɵ are fully contrastive anywhere. So BrE look could be transcribed as løk, Australian nurse as nøːs. But to let a descriptive choice be influenced by symbol shape would strike me as a case of the tail wagging the dog. Surely a better option would be to replace Bardot with a better symbol. Of course I don’t mean submitting a new creation to the Unicode Consortium. What we need is a nice, distinct, memorable symbol that’s already in the system but happens to be unemployed and available for work. It seems to me that a suitable candidate exists in the IPA Extensions block, where it’s been languishing on the substitute bench since 1989. I’m referring to U+0277 (just two digits up from Bardot), LATIN SMALL LETTER CLOSED OMEGA or, as it used to be known to phoneticians, buttocks: ɷ. This would mean, for instance, that we could transcribe the backer kind of FOOT as ʊ, and the fronter kind as ɷ, e.g. Australian gʊd, standard BrE gɷd. Regardless of its usefulness or otherwise in English, any linguist who wanted to notate a rounded close-mid central vowel would be able to do so without fear of confusion with schwa. Anyone in favour of re-submitting buttocks to the IPA? https://www.englishspeechservices.com/wp-content/uploads/2015/03/pixabay/6/butt_1425336728.jpg 640 480 Geoff Lindsey https://www.englishspeechservices.com/wp-content/uploads/2019/03/blue-mono-logo-small.png Geoff Lindsey2012-08-22 08:53:172015-03-02 22:54:36Rebooting buttocks? Will tune in to Stephen Fry’s broadcast on Friday! I like the idea of reintroducing ɷ for the FOOT vowel to make it distinct from the German back vowel of kapUtt, but only if ɷ retains its original value, i.e. halfway between central and fully back, thus replacing ʊ and making it fully back instead. I don’t hear the initial portions of loo/leçon and moo/menu in the samples above identical, the French ones are clearly more open, so I don’t think they should be transcribed with the same symbols. Since the openness of this central FOOT vowel is comparable more to [ʊ] than to [o], I think the proper symbol would be the barred ʊ, i.e. ᵿ, U+1D7F, which is found in Arial as well as in Segoe UI. They’d make up a nice barred sequence of symbols of ʉᵿɵ that would be analogous to the fully back sequence of uʊo. In short, FOOT could be central ᵿ as well as less central ɷ depending on accent, both different from the German kapUtt vowel of fully back ʊ. However, if people didn’t have the habit of transcribing sounds in bold and reverted to brackets instead, telling ɵ and ə apart wouldn’t be such a problem: [ɵə]. The symbol [ɵ] still wouldn’t be the best choice for FOOT, though. I don’t hear them as the same either. The French ones have a distinct…well…French sound to them. The English ones don’t. Just out of curiosity, when you say “fully back ʊ” do you mean an [ʊ] that’s as back as [u] and [o]? P.S. I personally don’t think the bold ɵ and ə in your comment are any harder to tell apart than the non bold ɵ and ə. Maybe that’s just me though. Yes, by fully back [ʊ] I mean a sound halfway between [u] and [o]. I don’t have any difficulties telling bold ɵ and ə apart, either, but I can imagine that on some systems with different browsers and fonts installed or different font smoothing settings applied, it might be more difficult for untrained eyes to distinguish them. When I was a child, the first times I heard a GOOSE vowel from native speakers of English, I analysed it as a diphtong going from the French BUSE vowel to French the BOUSE vowel. Nowadays, I still happen to be sometimes under the impression that some speakers realize the GOOSE vowel “[yw]” or “[ʏw]”. Am I the only one to hear this ? It’s not clear to me whether you’re proposing that the symbol ɵ be replaced by ɷ, or whether ɷ should be a new symbol with a slightly different definition to ɵ. Would you clarify please? I agree that the pronunciation of GOOSE has, in most parts of England, moved a long way from [u:] and that new symbols should be considered. I recently misheard Samira Ahmed’s “choose” as “cheese” – yet she is a mainstream speaker and I am not. I don’t think that FOOT has changed as much, or at least not across as wide a geographical area. Is the modern south-eastern pronunciation always rounded? If not, how about using ɘ? I believe that Roca & Johnson used ɘ to represent the Deep South’s STRUT vowel. I live in neither south, but my impressions are that south-east England FOOT is similar to US Deep South STRUT. Thanks – I don’t have much time right now for proper replies, but I’ve reworded the post to clarify that I was entertaining the straightforward replacement of ɵ with ɷ. Surely an improvement in terms of visual differentiation. GL didn’t say the two vowels were identical, he said they sounded ‘not unlike’ each other. To my ear that’s certainly true. You’re certainly not the only one to hear GOOSE starting at [y] or [ʏ] – see for instance these accounts of Multicultural London English; and I believe there are US accents with this too. John Wells has also blogged about GOOSE-fronting. 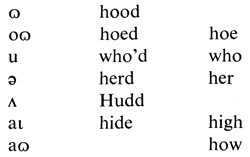 The opening of Howard Jacobson’s new book, Zoo Time, has some eye-dialect for the contemporary Standard British FOOT vowel. His narrator is infuriated by people talking about his new ‘berk’ – i.e. book. This spelling gets across centralness but at the price of height, and will be incomprehensible to many rhotic readers. I suppose I’d have gone for ‘bick’, but it would be nice to be able to use ɷ. He contrasts this with how it should be pronounced – RP (or at least poshed-up Cheshire) ‘book’, or at least working-class Lancashire ‘book to rhyme with fook’ (or some such). It’s a very peevish first chapter, and despite being in character the peeving is so transparently the author’s that I got infuriated too, and stopped reading there.